Elite Sports Tours is headed to Fenway Park to see the Toronto Blue Jays vs Boston Red Sox June 21-23 2019. Elite Sports Tours is headed to Orioles Park at Camden Yards to see the Toronto Blue Jays vs Baltimore Orioles August 2-5, 2019. See the Toronto Blue Jays vs Seattle Mariners on their west coast road trip to Safeco Field August 23-25. We send multiple buses down including small and large groups on our Buffalo Bills Bus Trips. Our football trips from Toronto are very popular so book early! We send multiple buses down including small and large groups on our Cleveland Browns Bus Tours. Pick up locations are from all arcross the Greater Toronto Area! Sign up for the waitlist to get travel packages to Dallas to see the Winter Classic between the Nashville Predators and Dallas Stars on January 1st 2020 at the Cotton Bowl! Specializing in Bus Tours sending fans from across the GTA to experience live sports. Planning a sports trip to an unfamiliar city can be difficult. Our staff have experience traveling to see sporting events themselves and use that knowledge to provide the best bus tour experience for our clients. We focus on delivering the best value when providing bus tour packages including hotel accomodations close to the event and attractions the city has to offer. Traveling with other sports fans is the best way to travel. Just show up and we do all the work. Our buses are luxury coach buses with washrooms, TV's, overhead storage, heat & air conditioning. Our staff's goal is to ensure you have the best experience possible when traveling to cross a stadium off your bucket list. 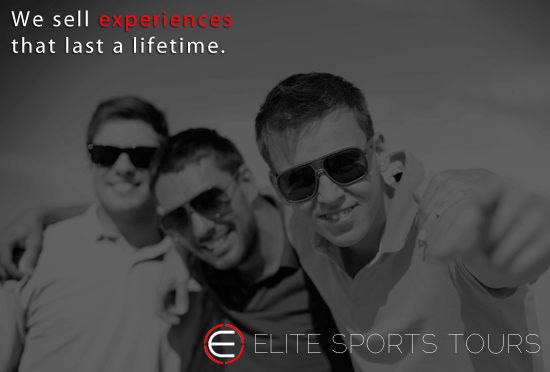 When you travel with Elite Sports Tours you can rest assured that all you have to worry about is what jersey you are going to wear!